As many as 54 Indian fishermen have been arrested by the Sri Lankan Navy for allegedly poaching in island’s waters off the coast of Kankesanturai and Talaimannar in the north. 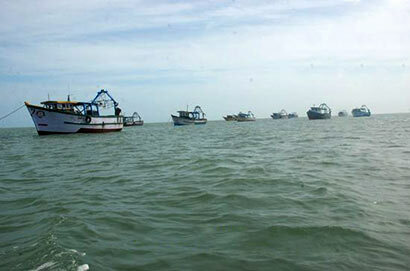 Sri Lankan Naval spokesman Commander Indika Silva said that 21 fishermen were arrested and five boats were seized at Kankesanturai while the rest of them on another five boats were arrested at Talaimannar last night. They were being brought to respective fisheries inspection offices for further action, Silva said. The arrests came ahead of announcement of the dates for the direct fisher community talks between India and Sri Lanka. Sri Lanka had released some 86 Indian fishermen last week as a goodwill gesture towards the visit of Prime Minister Narendra Modi, the first Indian leader to visit Sri Lanka since 1987, PTI reports.